A fire destroys the stability and security of your family’s home. It leaves families in financial and emotional distress. And it often results in injuries and sometimes deaths. More than 3,000 deaths occur as a result of fires every year. That means every day, on average, home fires kill seven people. Pennsylvania was among the top three states for fire deaths as recently as 2011. 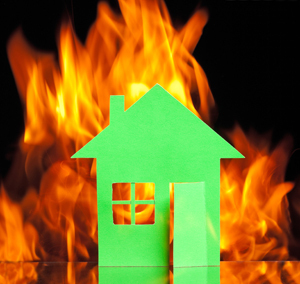 According to the U.S. Fire Administration, more fires occur in residential buildings during the cooler months. Now that the weather is changing and October is National Fire Prevention Month, this is the perfect time to assess the fire safety of your home and family. The National Safety Council reports that functioning smoke alarms reduce the risk of dying in a house fire by 50 percent. To ensure that your smoke detectors are working, test them on a monthly basis and be sure to change the batteries every six months. It is recommended that smoke alarms be installed on every level of the home, as well as outside every bedroom. Once a fire has ignited within the home, it is vital that everyone knows what and where to go. By making an emergency plan and practicing it every six months, you and your family will be better prepared if a fire does break out within your home. When creating your emergency plan, be sure to include two possible exits from each room whenever possible. If your exit plan includes windows, be sure that your windows can be opened quickly and easily from the inside. Be sure that your plan also allows for different possible scenarios and addresses family members that might need help exiting the home, such as young children and elderly relatives. During your home fire drills, practice your escape routes while crawling to avoid smoke inhalation. Also, time yourself to be sure that your exits take less than two minutes to complete. To help you map out your escape plan, the American Red Cross provides a worksheet you can personalize. Because kitchen fires are the leading cause of home fires, be sure that you take the necessary precautions to make your kitchen safe. Never leave the kitchen unattended while cooking, and clean appliances such as ovens, toasters, microwaves and toaster ovens on a consistent basis. Keep a fire extinguisher within easy access to the kitchen and install fire detectors at least 10 feet away from cooking areas. Ensure that nothing flammable is within 3 feet of heat sources, including heaters, furnaces and fireplaces. Clean and inspect furnaces and chimneys on an annual basis. Store gasoline and gas-powered tools outside the home. Do not overload electrical outlets or use damaged electrical cords. Never use extension cords for heating or air conditioning units. Teach children the dangers of playing with fire, lighters and matches. If your family suffers injury or death from a house fire, call on the KBG team for help. We’re here 24/7 to get the Results You Deserve®.